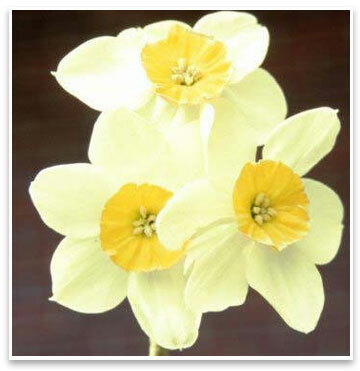 A basket of blooming narcissus is the perfect gift for anyone â€” teachers, coworkers, friends or family. To make your own narcissus basket you will need premium bulbs of paper-whites, Chinese sacred lilies, Grand Soleil d’Or, Cragford, or germanium narcissus. Choose a suitable flat basket (about 6-9 inches in diameter and 3-4 inches high). Line the basket with a circle of heavy-gauge (4 millimeter) plastic sheeting and cut to fit. Fill the plastic (or container) halfway to the top with pebbles or gravel. Add 6-8 bulbs, with the pointed side up and with their sides touching. Fill in with more pebbles to hold them upright. Cover the pebbles with sphagnum moss (optional). Add water to the base of the bulbs. Continue to water as necessary to keep the water at that level. Cover the basket with an upside-down cardboard box. Place in a cool spot for one and a half weeks or until sprouts are 3-4 inches tall. Uncover the basket and place it in a sunny window until the flowers open. Turn it daily for even growth. Enjoy the narcissus basket in the house during winter or give it as a gift! Allow six weeks for fully open flowers. Discard the bulbs after flowers fade. Bulbs forced in water cannot be reused. Tip: For a succession of flowers, plant up more baskets monthly.